Facebook and texting are like food and water for modern-day teenagers. They think in status updates, check e-mail before brushing their teeth and fall asleep while texting. Nicholi Wytovicz, a student at Shorecrest High School in Shoreline, Wash., said his social network usage is extreme. "I wake up, I check Facebook, I check Twitter," he said. "I'll say it: I have an addiction." This week, Wytovicz and his classmates have tried to go cold turkey in a challenge they called "the social experiment." Along with their rival high school, the students took a trip back to 1995: no Facebook, no texting, no e-mail, no Instant Messaging. Except for emergencies, they didn't even use their cell phones. 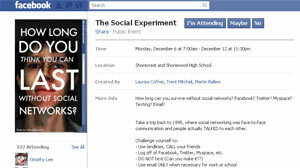 The 'social experiment' was somewhat inspired by the movie "The Social Network." The teenagers competed to see who could last the longest without any of the modern-day communication tools that define their lives. When they return to school on Monday, the students will see who survived without status updates, and who was tempted to text. The tech-addicted kids were inspired by their video production teacher, Trent Mitchell, who said he hoped his students could "think about ways they can communicate besides just sending a quick 'OMG, LOL' message." For some students, Mitchell's hope hit home. In a video diary, student Eimanne El Zein said by the end of the week, she started "to like 'the social experiment.' It's good to talk to people." Wytovicz said the time away from the computer led him to appreciate old-fashioned forms of entertainment, like reading a paper-and-ink book. "I haven't read a book in, I want to say, five or six months," he said. "I don't find time because I'm always on Facebook or Twitter." To learn more about the students, head to their website by clicking here. Mitchell said that soon after the movie "The Social Network" came out, he chided his students for paying more attention to the cell phones in their hands than their classmates by their sides. "I jokingly said, 'You guys couldn't go a week without social networks and texting,'" he said. "And one of my students [said], 'We should do that.' And about half the class cheered and about half the class booed." Ultimately, the half of the class that cheered won out and managed to convince not only classmates at their own school, but students at their rival high school, Shorewood, to participate in the experiment. Mitchell said about 250 students and teachers at each high school planned to go tech-free for the week. Students who survived the week -- and didn't get caught by the "Facebook spies" who were monitoring students' online habits -- stood to win prizes donated by businesses in the community. Students in his video production class were filming the experiment and creating documentaries out of their footage. Nate Matthews, 17, a senior at Shorewood High School, said that even one day into the experiment, he realized that old habits die hard. "When I woke up this morning, I had a thought and my first impulse was to post it on Facebook," he said. Matthews locked up his cell phone at home so that he wouldn't be seduced into peeking at texts, but said, "It's weird not to have something in my left pocket." He added that for the first time in his seven-month relationship with his girlfriend, he had to ask for her home phone number. And, worse yet, he said dreaded enduring the circa-1990s awkwardness of asking the parents if he could talk to his girlfriend. "She always has her cell phone on her. Why would I call her home phone and have to talk to her parents?" he asked. "I like her parents, but it's an awkward [conversation] that I've never had to do until this week." Katelyn Lahair, the 16-year-old Shorecrest junior who first took Mitchell's challenge seriously, said she warned her Facebook friends about her weeklong commitment Sunday night, with the update: "Bye Facebook, see you next week." Lahair said she kept her cell phone with her in case something came up, but deleted the Facebook application so that she wouldn't pull it up out of habit because usually she's on the site, "like, all day, every day." To keep herself from caving into temptation, Olivia Hepburn, a 17-year-old junior at Shorecrest, planned to leave her cell phone with Mitchell during the school day. She also contemplated asking her mother to change her Facebook password so that she wouldn't even be able to sign in. "It's going to be really hard to survive the week," she said as she began. The teachers -- who were actually once classmates themselves -- hoped the experiment encouraged the students to think about how technology influences their lives -- for better and for worse. "Having witnessed how student behavior, and human behavior, has evolved since the time that both [Mitchell] and I were in high school, things have changed dramatically in the life of a high school student and how they communicate with one another," said Marty Ballew, the video production teacher coordinating the experiment at Shorewood High School. "We want to encourage students to reflect on the impact of technology -- the good and the bad and the ugly." The students were competitive about the experiment, especially because the two schools were long been locked in competition. But they also were open to personal lessons too. "I figure I can do it and it won't be that hard. And if it is that hard, I'll probably have to re-evaluate my relationship with these things," said Shorewood student Matthews before the experiment. "I want to prove to myself, as I think I will that they're an addition to my life, not an addiction."